Home » Adidas AdiPower Review – Good Lifting Shoe for Beginners? Adidas AdiPower Review – Good Lifting Shoe for Beginners? 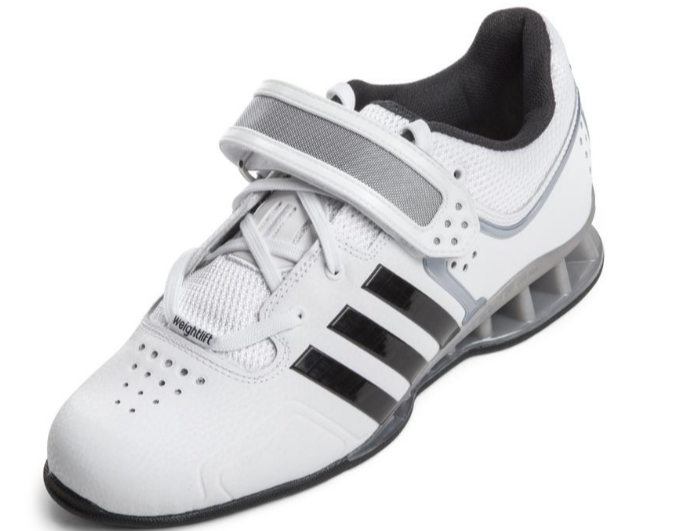 The Adidas AdiPower is one of the best known weightlifting shoes Adidas has ever created. These shoes were one of the first to utilize a full TPU heel, which spurred the popularity of this design among many weightlifting shoes. The Adidas AdiPowers had a few significant details that made them different from other shoes when released a few years ago. First, they utilized a PU coated rubber to increase the shoe’s durability, flexibility, and ventilation. Second, Adidas used a weightlifting-engineered chassis with a strong TPU heel for increase stability. Third, they decreased their strap count from three (AdiStars) to one, much like their PowerLift models. The Adidas AdiPowers weigh around 16.2 oz, which makes them slightly heavier than the Nike Romaleos 3s, but lighter than the Reebok Legacy Lifters. When it comes to hybrid lifting (CrossFit® style workouts), I wouldn’t recommend this shoe. I think their design is much more oriented towards Olympic lifting, but you can use them in a functional setting. I personally like a flatter heel for CrossFit style workouts, so I think the AdiPower design may be an issue for some lifters in this setting, but that’s my bias. 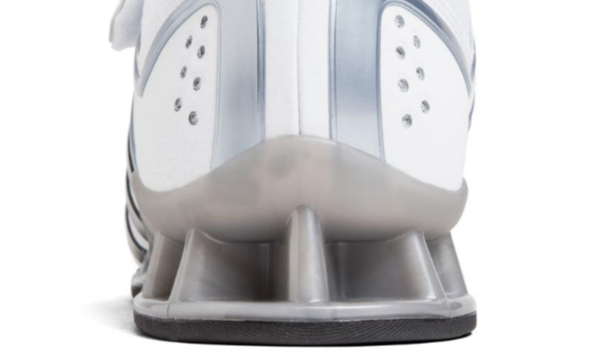 The effective heel height of the Adidas AdiPower’s is .75 inches or 20.1 millimeters, which makes this model similar to other popular lifters. The standard lifter’s heel height tends to be .75 inches, so these shoes fall into the hybrid lifting shoe category. Most lifters will benefit from a .75 inch heel, because it will help promote mobility without shifting their postures. This heel height is great for those who need a little help achieving depth, but have a decent squat on their own. They’re also a good height for multiple strength and power movements, not just squats. There’s only one scenario when I could see this heel height being an issue and that’s with lifters for special requirements. For example, taller and shorter athletes may benefit from a specific height, and not the standard .75″ heel. The Adidas AdiPowers have a solid thermoplastic polyurethane (TPU) heel, which is a lightweight non-compressible material often used for its sturdiness and resilience to abrasions. The AdiPower’s utilize a weightlifting-engineered chassis, which I liked. Their heel/sole were solid and stable, so you could really feel the ground underneath your food. Plus, TPU is durable, so the chances of this heel compressing are very small, even over an extended amount of time. I never had an issue with the heel compressing under maximal loads, or movements that rocked me back onto my heels. The only complaint I could envision someone having with this heel is with the TPU itself. If you’re someone who wants a wood or leather heel for an old school look and feel, then this may not be the heel for you. The upper shoe material of the AdiPower is a PU coated leather with a mixture of mesh around the heel and tongue. This material is designed with three purposes in mind and those are durability, flexibility, and breathability. I found their material to be durable and pretty resilient to premature ripping. They did scuff a little bit, but that can be easily rubbed out and cleaned. In terms of flexibility, these definitely weren’t the easiest to break in. They took me a couple weeks to fully break in and get comfortable, but once I did the leather hugged the foot very well. The mesh that makes up the tongue helped with breathability. These weren’t the most breathable shoes I’ve tried, but they never got so hot where they felt uncomfortable like the Nike Romaleos 2s. 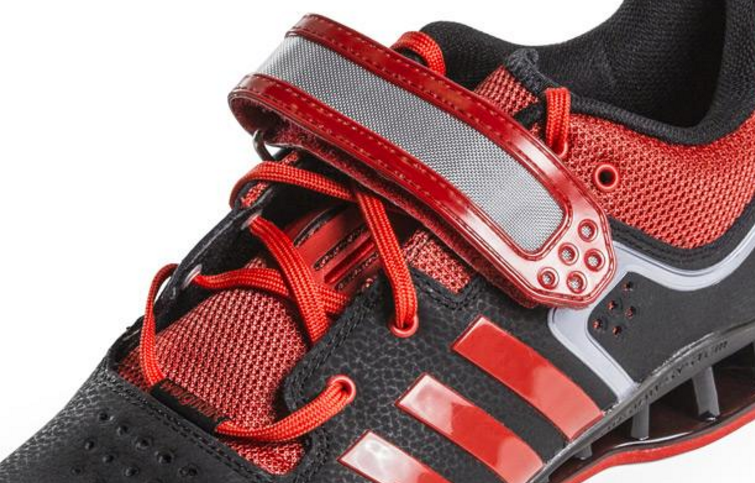 The Adidas AdiPower uses one strap at the top of the tongue, which is both a pro and con for lifters. It’s a pro for lifters who like a minimalist shoe and don’t have an issue with shoe tightness with just the laces. On the opposing side, some lifters really liked the three strap model the AdiStars offered. Plus, most lifters argue that the upper portion of the shoe is what stays the tightest, so the strap may be a little redundant. The one strap design is popular among a lot of lifters, because ankle stability is one of the biggest concerns when wearing these shoes. Their single strap did a pretty good job at holding the ankle tight, and didn’t have overlap like the Nike Romaleos 2s. The Adidas AdiPower’s price ranges. You can find older models for around $125.00, but for the newer white/silver ($179.00) and fully blacked out shoes ($200.00), they’re a little more pricey on Adidas’s website. It’s a durable shoe that is still widely used, so the price aligns with other newly released shoes like the Nike Romaleos 3s. 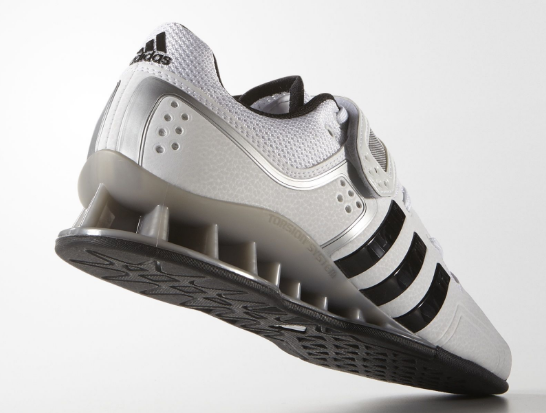 The Adidas AdiPowers are one of Adidas’s most popular lifting shoes to date. 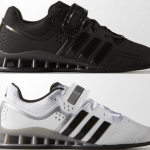 They could be considered the in-between model of the Adidas PowerLift (lower heel/powerlifting focused) and the Adidas Leistung models (higher heel/weightlifting focus). In addition, they paved the way for Adidas’s use of the popularized TPU heel. The Adidas AdiPower are a few years old, but still widely used among strength athletes everywhere. They were one of Adidas’s biggest lifting shoe successes and have multiple features that earn them the use by many athletes. Their TPU heel is lightweight and durable, which make them a viable choice for those in need of a long-lasting shoe. This shoe’s potential shortcomings fall in their security and their price. Some lifters feel as though Adidas should still utilize their three strap model. In addition, for an older shoe, I’d prefer if the price came down a little bit, but it is durable, so the price is somewhat justifiable. All in all, this lifter continues to stand the test of time and be a fan favorite, even with newer models on the market. I’m new to weightlifting shoes and still trying to find the right pair. I tried a pair of Adidas Powerlift 4’s but found the toe box a little too narrow. How does the toe box of the Adipower compare to the Powerlift 4? Hey man — the Adipower is a bit wider in the toe box compared to the Powerlift 4s! It’s also definitely wider than the Nike Rom 3s!